Husqvarna is set to go off-road racing in 2015 with a strong roster of championship-winning riders and the support of a new title sponsor- Rockstar Energy Drink. Husqvarna's off-road program is proud to welcome Rockstar Energy Drink as title sponsor, effectively creating the off-road division of Rockstar Energy Husqvarna Factory Racing. New to Husqvarna this year is past champion and eager contender, Josh Strang. Returning for a second year are factory riders Mike Brown and 2014 Champions Andrew DeLong and Jacob Argubright. "We are really excited to expand our race efforts with Husqvarna," said Rockstar Energy Drink Marketing Director, Mike Kelso. "We are proud to be a part of the rebirth of such a legendary brand." "Bringing on Rockstar Energy as a title sponsor is a really important step in our alliance as we take on off-road racing at the most reputable stages," said Husqvarna Motorcycles North American President, Jon-Erik Burleson. New to the Husqvarna team, Josh Strang will be contesting the 2015 GNCC Series aboard a Husqvarna FC 450 in the XC1 Pro class, and will also race the National Enduro series aboard an FC 350. Joining Strang in his 2015 efforts will be Husqvarna's off-road phenom Andrew DeLong. The reigning champion will be continuing his deep-seated relationship with Husqvarna, and defending his title in the AMA National Enduro series, as well as looking to make strides in the GNCC XC1 Pro ranks. DeLong will once again pilot a Husqvarna FC 350 in both championships. "I'm really excited for the 2015 season and defending my number one plate in the National Enduro Series," DeLong commented. "I'm also excited to try to put my Husqvarna FC 350 up on the GNCC podium at every race." Also continuing his term with Husqvarna is EnduroCross star Mike Brown. The accomplished Supercross, motocross and off-road racer, who recently returned from the ISDE where he proudly represented his country on the US Trophy Team, will once again take on the AMA EnduroCross Series, along with other select events in 2015. "Brownie" continues to be one of the most revered riders in off-road, and a crowd favorite wherever he goes. He will once again be contesting the AMA EnduroCross series aboard an FC 350, and racing select races around the globe aboard an FC 450. AMA West National Hare Scrambles Champion Jacob Argubright is back for another season with Husqvarna, and will be flying the Rockstar Energy Husqvarna Factory Racing colors in the AMA National Hare & Hound Series. The desert specialist will also be defending his championship in the West Hare Scrambles series, all aboard the capable FC 450. "We had some great moments in 2014, and we're looking forward to an even better season in 2015," Argubright said. "I'm excited to put Husqvarna back on top of the podium in the desert, where so many people remember them dominating. It's going to be a good year." 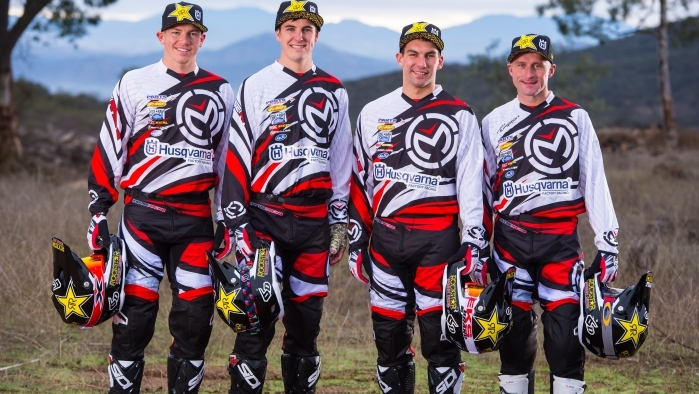 "I am really excited about the group of riders we have for 2015," added Timmy Weigand, Husqvarna's Off-road team Manager. "They are all front runners in their respective series'. I look forward to this year and the opportunity we have as a team to carry on the values and tradition of Husqvarna. We are excited to have Rockstar Energy on board with us. I feel they help bring our team to another level and add some excitement." The four-man Rockstar Energy Husqvarna Factory Racing - Off-road team will be racing alongside additional Husqvarna factory support riders and Rockstar Athletes, Colton Haaker and Ryan Sipes. Haaker - who was a front-runner in the 2014 AMA EnduroCross series - will be taking on the 10-round 2015 championship aboard a Husqvarna FC 350. Former Supercross racer and fellow support rider Ryan Sipes will be riding a Husqvarna FC 450 in the XC1 Pro class of the 2015 GNCC series, as well as select rounds of the National Enduro Series. Rockstar Energy Husqvarna Factory Racing - Off-road Team sponsors include Rockstar Energy Drink, FMF, Moose, Bel-Ray, Dunlop, ProTaper, Sidi, Rekluse, Motion Pro, VP Racing Fuel, Cycra, IMS Products, RK Excel, Dubya, 6D Helmets, Braking, Super B Batteries, DT1 Air and Oil Filters, Corona Motorhome Rentals, Matrix, Think Tech Seats, ARC Levers, and TM Designworks. Husqvarna has continued to expand its professional race team to compete in AMA Supercross, AMA Pro Motocross, AMA National Enduro, GNCC, AMA EnduroCross, OMA Nationals, AMA West Hare Scrambles Series and AMA National Hare & Hound championships. Husqvarna team riders are competing aboard 2014 Husqvarna FC 450, FC 350, FC 250, FE 350, TC 250 and TE 300 models.